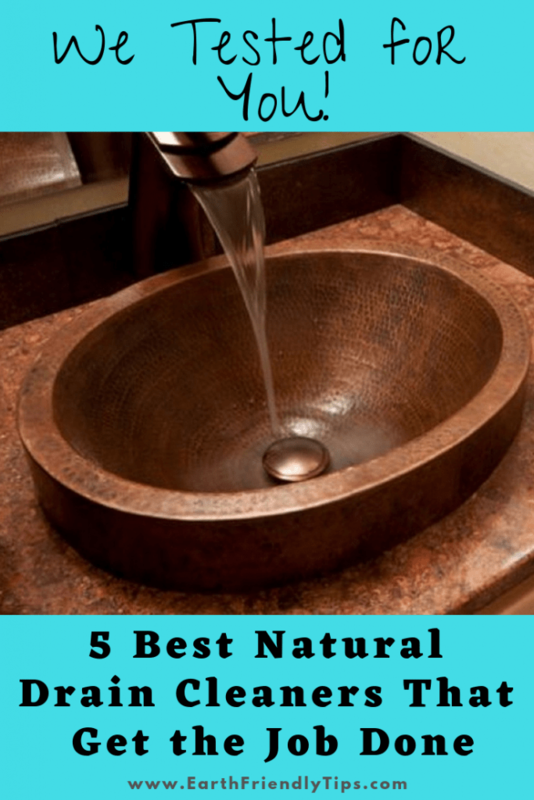 What Is the Best Natural Drain Cleaner? If you have a clogged drain and you’re looking for the best drain cleaner, you don’t have to turn to dangerous conventional drain cleaners. Instead, go for the best natural drain cleaner. The main ingredient in most conventional drain cleaners is sodium hydroxide. This corrosive chemical is usually better known as lye or caustic soda, and it’s an irritant that can aggravate respiratory airways and burn skin. Plus, sodium hydroxide can sit in your pipes and eat away at the glue holding the pipes together, soften and break PVC pipes, and damage your plumbing system. What About Baking Soda and Vinegar? With all that in mind, perhaps you’ve already Googled how to naturally clear a clogged drain and found plenty of people saying you should pour baking soda and vinegar down the drain. These two ingredients create such an incredible fizz, surely they can break through a clog. If you’ve already tried this and you’re still sitting there with a clogged drain, I’m about to break some news to you that you just learned the hard way: baking soda and vinegar don’t work to clear a clogged drain. 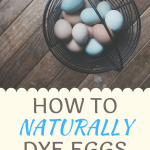 While you can check out this post to learn more about why baking soda and vinegar are two natural cleaning ingredients you should never mix, the basic explanation is that vinegar is acidic and baking soda is alkaline, so they cancel each other out. Is There an Eco-Friendly Drain Cleaner Option? OK. So now you know that baking soda and vinegar won’t work. Does that mean you have to go back to a conventional drain cleaner? Nope! You still have several eco-friendly options to easily and effectively clear a clogged drain. If the clog is near the top of the pipe, you can use one of these natural solutions to clear a clogged drain. If the clog is deep in the pipe, that’s when you want to turn to the best natural drain cleaner. When you start looking for natural drain cleaners, you’ll discover there are several options on the market. Of course, you need your drain unclogged now. 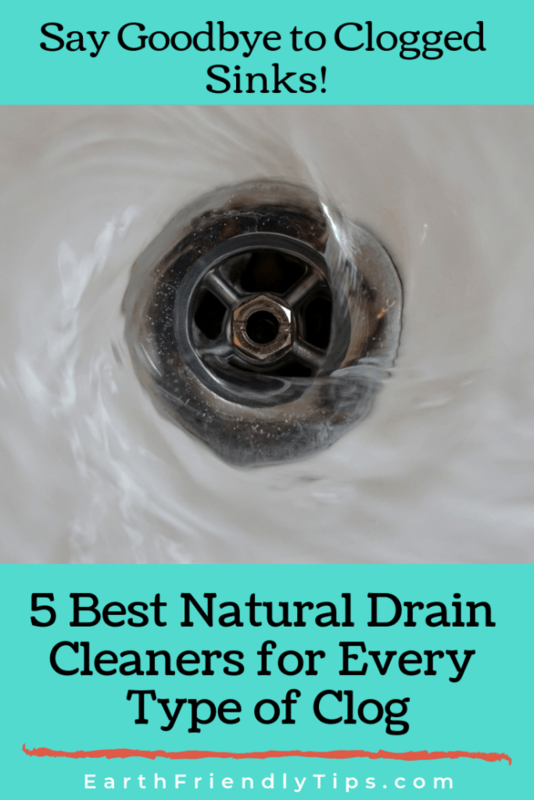 Since you don’t have time to test each natural drain cleaner (and since the sink in our master bathroom always seems to clog) I tested these drain cleaners for you so you can learn which is the best natural drain cleaner. Out of all the natural drain cleaners I tried, Green Gobbler worked the best and is always the one I highly recommend. It’s non-caustic and non-corrosive, so it’s safe to use with septic systems. The natural drain cleaner is also odorless, so I never worry about using it around my family. It’s made using natural enzymes that quickly dissolve hair, fats, oils, paper, and other obstructions. Yet it’s also biodegradable and won’t harm our rivers and oceans. Plus, you’ll find a variety of products that you can use on tubs, sinks, and toilets. I prefer to get a bottle of the Green Gobbler Dissolve Gel because I can simply measure out how much I need, and I find the gel is thick enough to sink through any standing water in the pipe. Like other products on this list ECOS Earth Enzymes uses enzymes to cut through hair, grease, and other buildup in the drain. This makes the drain cleaner safe for people, pets, and the environment. It’s non-corrosive, so it won’t damage pipes or septic systems. Plus, it comes from a company that doesn’t test on animals, uses zero waste guidelines when manufacturing, and has manufacturing plants powered by 100% renewable energy. The directions say to pour the diluted cleaner down the drain and leave it sit for at least an hour to give the enzymes time to work. However, I found that leaving it sit overnight was even better. If you’re looking for the best natural drain cleaner that has a nice fragrance, consider Earthworm Drain Cleaner. It has a fresh citrus and sage fragrance that’s good to use if the clog is causing an odor. It uses natural enzymes to clear clogs, so it’s safe to use around children and pets. 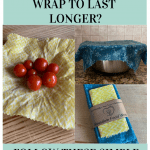 You can also use it in kitchen and bathroom sinks, bathtubs, and shower drains. The best natural drain cleaner to get if you need something that offers multiple uses is Harris Drain Clean. The 18-ounce container will give you 40 treatments. 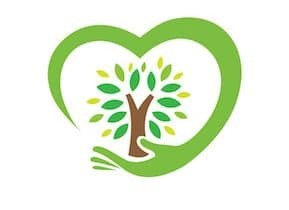 Harris uses biodegradable natural enzymes that are safe to use on all plumbing, including PVC pipes and chrome, brass, gold, and copper fixtures. The enzymes can remove years of buildup, and you can even use it once a month to prevent clogs from forming in the first place. Unique Super Digest-It is another eco-friendly drain cleaner to consider. It uses bacteria that eat away at the clog to clear your pipe, and they don’t stop eating until they run out of food. At that point, your drain is clear! Since this drain cleaner is non-toxic and eco-friendly, it’s safe to use around pets and children. It’s also non-corroding, so it’s safe to use on every type of plumbing fixture. While the company says the product can open a clogged drain in an hour, I found it worked best when left to work overnight. Out of all the natural drain cleaners I tested, these five products worked the best to clear the clog in my sink. If you discover water isn’t draining through the pipes in your home as quickly as it once did, you don’t have to turn to dangerous chemicals to get it moving again. Instead, give one of these best drain cleaners a try to see how easy and effective it is to go green.